Since I was once a baseball player, my father was a baseball player, and both my sons are baseball players, anything about baseball catches my eye, so I read on. The article talked about how baseball was not a major sport in China and, even though they’ve got a billion plus people, talent was pretty tough to find. Regardless, a league was forming because that’s what the powers in China wanted. Baseball in China was for real! After I hang up my wife says, “Maybe I can find out something about China baseball here in Japan.” A couple days go by then, over dinner, she gives me the news. “There’s not much out there about baseball in China. A few people have heard about it but no one thinks much of it.” Consequently, we went on to other things and baseball in China quietly slipped out of my mind. As I say, my oldest son just finished a college baseball career. Playing baseball has been his dream ever since he and I began tossing the ball back and forth in the narrow street in front of our house in the hills north of San Francisco. An injury suffered while playing in the illustrious Cape Cod Baseball League haunted his final year at Wake Forest, thus discouraging offers from major league teams. Nevertheless, he wasn’t about to quit. As a result, this winter, I arranged for a place in Scottsdale, Arizona, from where he could make his run at the Bigs. What better place than Scottsdale with warm weather, dry grass, and a multitude of spring training facilities no more than a throw from center away. I arrive a few days early to set up camp and check out what’s available. We need a field for throwing, a place for me to hit the kid grounders, a weight training facility, and a track for running. No problem, everything is within a bicycle ride. The one stumbling block is live batting practice. No way am I gonna do it. He can bang from both sides of the plate and my time on the hill has long since passed. I hop on my mountain bike. Behind the local community college my eyes catch the sight of baseball fields and I ride over in the hopes of finding a coach kind enough to let my son join in BP. Except for a couple of maintenance men, the fields are empty. I ask them when the team is coming back. They say something about Las Vegas and it’ll be a few days. I notice another field and ask who plays over there. The Chinese team? What do you mean the Chinese team? A few days later I head back to the fields to check out the team from China. Everyone’s chattering in Chinese and going about the business of baseball. Other than thank you, I don’t know a word of Chinese. But it’s not a problem. They, like ball players everywhere, are talking baseball, and that I understand. I find a place in the shade and sit back. As anyone who has spent time watching baseball practice knows, some of the players stand out and giving them nicknames helps to remember who’s who. My mind comes up with a few. ‘High Sox’ and ‘Say Hey’. ‘Long Sleeves’, ‘Submarine’, and ‘Lefty’. There’s at least 25 players and several other guys in uniforms who I take for coaches. I call the whole group… China Team. BP’s happening and balls are flying. There a shot toward Say Hey, a player with a 24 on his back. He moves over, reaches up, and snags nothing but air. I flash on The Say Hey Kid, Willie Mays, flicking his shades down, making his signature basket catch. Then I chastise myself. Give this 24 a break. I shouldn’t compare anyone on the planet to a baseball god like Mays. Long Sleeves steps in for his cuts. Bam he rips it to left center. Bam out of the park. This kid can stick. Maybe ‘Kiyoman’, after Japan’s Kiyohara, is a better name. He certainly has that look. They come and they go. Lefty steps in the box looking like Ichiro. What’s his speed on the paths? I’d shorten his swing and teach him to slap on the run. Safe at first is money. My eyes find Jimmy Lefevbre. He’s pacing the cage, giving pointers to anyone who’ll listen. “Keep your shoulder in. You wanna look away and adjust in.” Sometimes he picks up a bat and swings at the air as he talks. I remember when those same swings brought roars to the sold-out Dodger Stadium. I find out they’ll soon be heading to Japan to play in the Asian Regional of the World Baseball Classic at Tokyo Dome. They’ll be pitted against Japan, Korea, and Taiwan. The top two teams will then head to the United States for playoffs against teams from around the world. Ultimately, on March 20th in San Diego, the very first World Championship game will be played. 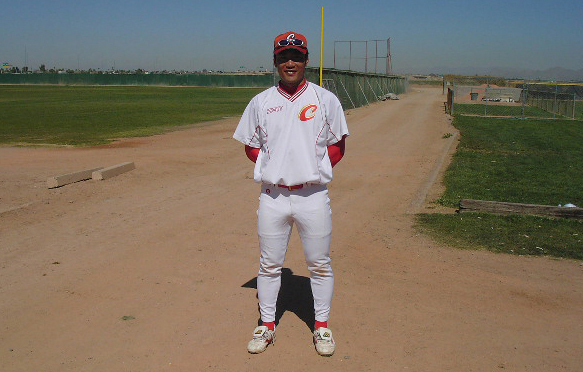 Most of the players on China Team are from the new professional baseball league in China. There’s six teams – Tianjin Lions, Shanghai Eagles, Sichuan Dragons, Beijing Tigers, Guangdong Leopards, and Hope Stars. He tells me his name is Zhang Jun. I ask who’s his favorite major league player? How many pitches you got? “Four. Fastball, breaker, slider, change up.” He smiles confidence. Who’s your favorite Major League Team? “Chicago White Sox.” You and Bob Dylan. Cool. You must be a big star in Shanghai. I look back to the field. Long Sleeves is carrying cups of water and delivering them with a slight bow to Coach Lefevbre. Who is that guy? Lefevbre, whose career includes managing the Chicago Cubs, the Seattle Mariners, and the Milwaukee Brewers, says he’s a paid consultant for Major League Baseball and it’s his job to develop baseball players in China. I ask if any of the players on China Team has major league talent. “There’s a couple. Wang Wei’s got a major league arm behind the plate and he can hit. He’s smart. He has all the intangibles.” Lefevbre gestures toward Long Sleeves. China Team’s manager is clearly a busy man so I tell him I’ll come back the next day with more questions. He says he’s always at the field by 7am and would be happy to talk with me. I stick around for a practice game against another World Baseball aspirant, South Africa. They arrive in a meticulous white and silver bus. It’s a little surprising to think of baseball in South Africa. But as these players work their way around the field I’m reminded of the Australian teams I watched back in the late Nineties when my older son toured Down Under with an American team. The Aussies have their share of players in the majors so why not South Africa? Lefty’s in center, wearing number 1. Fast and quick with the glove. I find out he stars for the Beijing Tigers. His name is Sun Liang Feng. I hear China Team’s pitching coach, Bruce Hurst, a big-time starter with the Boston Red Sox in the Eighties, shouting to his pitcher on the mound. “That-a-boy. Very good. Good pitch. That-a-baby. What was that pitch? A slider? Why? He’s taking 3 and O. Throw it down the middle!” Whatever Hurst sends out, Sam Kao the translator echoes in Chinese, and pitcher Chen Kun of the Sichuan Dragons responds. Called strike three. “Good job!” Hurst yells. Standing near me with his arm iced is Submarine. He’d pitched earlier, showing his submarine style and wearing number 19. I glance over and his face fills with a radiant smile. I mimic my submarine pitch. He responds with his and we share the moment. All the players wear their pants to their ankles except one, High Sox. He’s Li Lei, number 6, a second baseman under contract with Beijing. I ask with a gesture why his socks are high. He answers by flashing his hand forward… Fast! Long Sleeves aka Wang Wei, number 52, sends a shot down the left field line. I watch as he rounds first and glides into second. Major league. After the game with South Africa, as I’m leaving I glance back and see Coach Lefevbre standing in the middle of China Team’s huddle. They’re hanging on his words and Sam Kao’s translation. I catch a bit of Lefevbre’s speech. “In my mind we’re ready. We’re ready to go.” And with that the huddle breaks and China Team heads to a line of waiting vans. Soon they’ll be flying to Tokyo where Japan, South Korea, and Taiwan are waiting and probably thinking the Chinese National Baseball Team will not be bringing much to the plate. Those three countries have dynamic and historic professional leagues with huge followings. They’ve got players in the majors and China, by comparison, is just a babe in the woods. Well, maybe they’re underdogs, but China Team is not without their assets. Coach Hurst’s “That-a-babys” and his wealth of experience is gonna count for something. And perhaps not everyone in China knows about their Chinese National Baseball Team. Let’s say only 25% do. If that’s true then they’ve got the support of more than 300 million people and that’s more than the population of Japan, South Korea, and Taiwan combined. And, think what Jimmy Lefevbre brings. I’m sure he wasn’t happy I didn’t show that last day at seven. My morning had other ideas and I didn’t arrive until ten. But you gotta believe his commitment to early mornings coupled with all that Dodger Blue running in his veins isn’t just gonna roll over. Talk about intangibles. We mortals see grass and dirt and players and a ball, combining into a game. Well, he is the game. You know, one with it – pure Buddhism. And Buddhism and Japan are like rice and chop sticks, hot dogs and mustard, a ball and a glove. That will count for something. What about High Sox, Say Hey, Long Sleeves, Submarine, Lefty, Shanghai’s pitcher, Zhang Jun, and all the other China Team players making their run at greatness. Baseball’s gonna be big in China and on this team are the Chinese baseball gods of tomorrow. Now that’s big and it’s gonna count.